From what we’ve told you already the 2015 Ford Mustang will be making a global debut and will likely feature Ford’s new turbo EcoBoost with the V8 a likely option. This all means that the new Mustang will likely be more of a modern sports car than a retro throwback like previous models. Think Evos concept, if you dare. 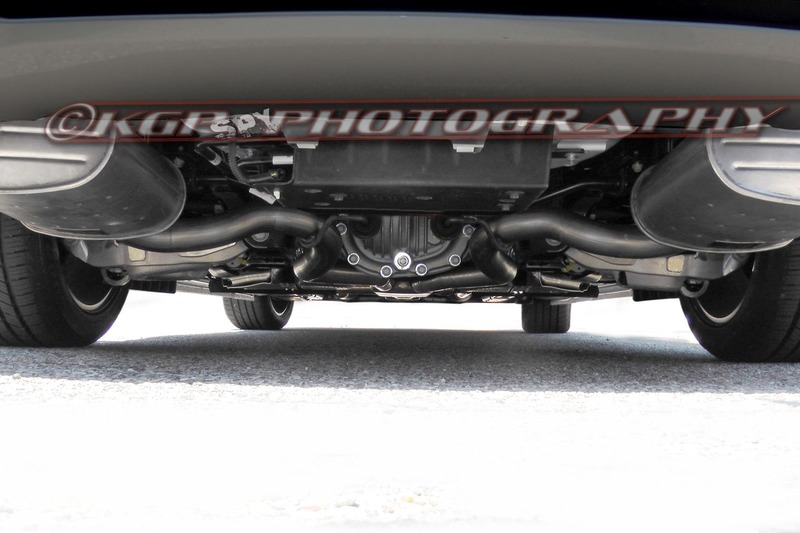 From the last spy photos, we gathered that the new ‘Stang will have IRS, Independent Rear Suspension. Sorry, all you live axle fellas. Also, looking at the new steering wheel, there’s enough buttons and gadgets to make you feel like you’re in a plane ready for takeoff. Ford borrowed the gauge cluster from the ’13 Escape by using blue needles instead of black gauges and looks to have MyFord Touch technology. The gadgets may be hiding under yet another shell while Ford is testing out their new technology. 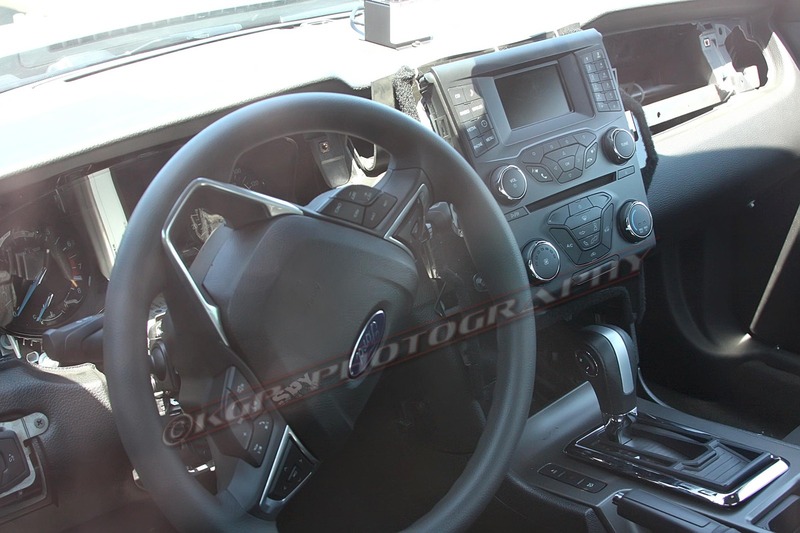 Check out the center stack and you’ll see a small info screen similar to the ones used in the new ‘13 F-150, minus a few buttons. That’s all we know so far about the ’15 design and who knows what time will tell as the 50th anniversary draws closer. Stay tuned! UPDATE: Ford has revealed their new logo for the 50th anniversary Ford Mustang. So, where do you think Ford is going with the 2015 Mustang? Tell us below! Previous Entry How To Upgrade Your Mustang’s Ignition for $50 Cheaper! Next Entry VIDEO: The AM Girls Take a “Scary” Ride in our 2013 GT! Swapping the pony emblem on the steering wheel for a Ford emblem? Blah. I guarantee you Ford won’t use it on production car. This whole dash is just to keep public and competition guessing (wrongly usually) until production candidate is finalized. The new Mustang will be a true Athlete. Power + Agility. The rear independent suspension look’s the same as the 99-2004 Cobra’s. Hopefully, the new Mustang will be 2 to 300 pounds lighter than overweight car we have now. The Problem is that when I bought my mustang I bought the base because i love the basic functions because a real car lover drives the car how it is meant to be and shouldn’t need all of the extra luxury options. I only hope that Ford will keep it NA because turbos are for ricers and Mustangs need to stay true to their heritage. More like you bought the base because you couldn’t afford anything more. Such a BS excuse. I question the term “spy photo.” Are we to believe that someone got pictures of the undercarriage and interior, but no body shots? And the undercarriage is spotless, so it seems unlikely that these were taken outside of the proving grounds. 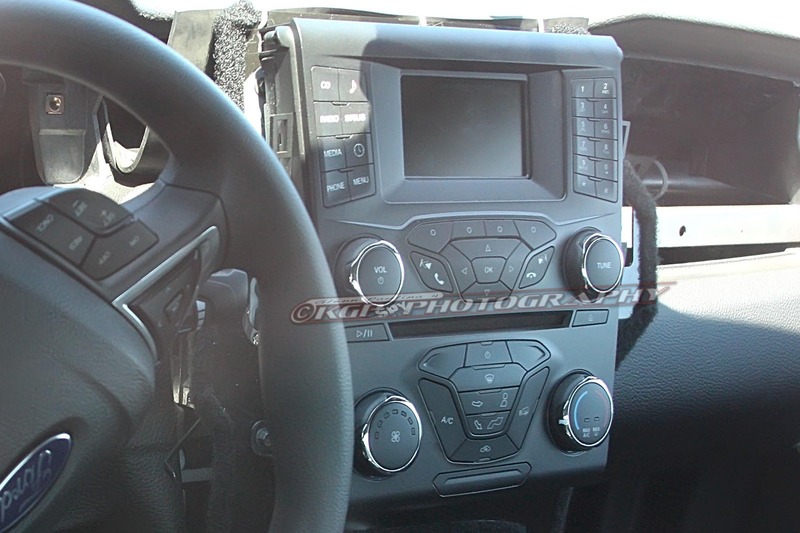 Still, the upper dash shape does scream Mustang, but it looks like the rest are taken off other vehicles for testing – remember, we’re looking at a test mule. turbos are not for ricers you dork. get out of the stone age. people are adding turbo kits to 5.0’s, 4.6, 5.7 and the list goes on. functional horse power with out making you stop at the pump 10 times day or weighting down your car with unnecessary displacement. I had a 71 thunderbird stoker and it was fun, but corners and not paying double my rent in gas every month is way more fun. you will learn. do your research. id take a 5.0 with 15 pounds boost over a 500HP 2 3/4 ton muscle car any day. unless were talking OG shebly or mach. Well sounds like you need to get a Pruis if you are worried about gas prices. Another thing muscle cars built this country. that is not a mustang spy pic. Ford please give us a option to order the factory stand alone supercharger or turbo option for the 5.o. From a marketing point it could give ford an edge over the other pony cars, in a soft market this could be a powerful tool. Keep the svt or Shelby with all the ad ons for those that money is not an issue and need the best.High performance units sold as a low cost option leader will keep the competitors in a tough position, lowering the cash flow for future upgrades. I hope they make a better automatic transmission, ala the Porsche PDK! This is what a modern “sports” car needs. If you are gonna change it from a muscle car to a sports car then please do it properly! I love my 2013 manual GT, but I would consider a dual clutch PDK like auto with both auto and manual modes.